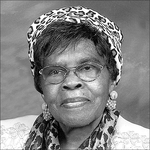 Obituary for Rosa J. McLaurin | McGuire Funeral Service, Inc.
Rosa Jacobs McLaurin, 90, of Washington, DC, transitioned from earthly labor to her heavenly reward. She was a retired DC Public Schools educator. Rosa is survived by her husband of 59 years, James H. McLaurin; brother, Abraham Jacobs, Sr. and sister, Sarah Jacobs DeShields, both of Wilmington, NC; a host of nieces and nephews, other relatives and friends.